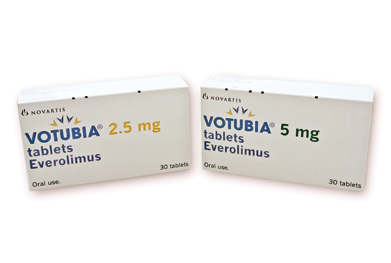 Votubia (everolimus) is licensed for the treatment of subependymal giant cell astrocytoma (SEGA) associated with tuberous sclerosis complex (TSC) not amenable to surgery. TSC is a rare autosomal dominant disorder associated with the growth of benign tumours. These tumours commonly include SEGA (in 5–20% of patients), which can obstruct spinal fluid flow in the ventricles, resulting in neurological symptoms. The current standard of care for SEGA is surgical resection, which is not always possible owing to the deep location of the tumours. An open-label study investigated the efficacy of everolimus in 28 children aged 3 years or older who had serial growth of SEGA. The primary efficacy endpoint was reduction in SEGA volume after 6 months. Patients received a starting dose of everolimus 3mg/m2 once daily, which was adjusted to give a whole-blood trough everolimus level of 5–15 nanogram/ml; treatment continued for 6 months for the efficacy analysis, after which patients were eligible to be moved into an open-ended extension phase. Within 3 months, marked reductions in tumour volume were observed; at 6 months, the independent central radiology review showed that everolimus had significantly reduced the volume of the primary SEGA (P<0.001). There were reductions in primary tumour volume of at least 30% in 21 patients and at least 50% in 9 patients. Everolimus is also available as Afinitor for the treatment of renal cell carcinoma and neuroendocrine pancreatic tumours.